Exploring the Dress Daggers and Swords of the German SS by Thomas Wittman. -Primary Record Documentation: This service includes my certified letter stating the name of the individual to whom the SS membership number was assigned, his official SS number and his unit. This letter is accompanied by a certified copy of the actual primary source record that documents the SS Mann and his number that was found among the captured German records. This package can also include copies of some of the most essential records found in the SS Mann's files listed below. Contact us to see if we can identify your SS dagger's Mann! If so, we will then give you an estimate for your Primary Record Documentation package. -Standard Research Package: This service includes the certified letter and all of the most important records available on individuals that may include: all SS Dienstalterslistes entries, SS Officer Files, SS Enlisted Files, Race & Settlement Files, NSDAP Membership File Cards and digitally enhanced prints of all photographs (when available). Additional records may be included if they are found. We also provide a summary in English of the individual's personal & service records. Please note: In this package, records from SS Officer, Enlisted, and Race & Settlement Files are now 8 1/2 x 11 in. (216 mm x 279 mm) format since we can make digital scans from the microfilm in the Archives. -Advanced Research Package: For the advanced collector, we offer an additional option of a custom Documentation Portfolio which includes all documents presented in a convenient 8 1/2 in. x 11 in. (216 mm x 279 mm) format . Often additional information about your SS member could be found among several record groups as well. These include the Nazi party (NSDAP) membership rolls, SS Officer and Enlisted Men files, and the records of the Office of Race and Resettlement (RuSha). Some of these record groups can yield surprising amounts of information including personnel service file, award records, photographs of the SS member and his wife, autobiographies, and even family trees sometimes going back before 1800! We also provide a summary in English of the individual's personal & service records. Fee for this custom Documentation Portfolio is determined by the amount of information available. 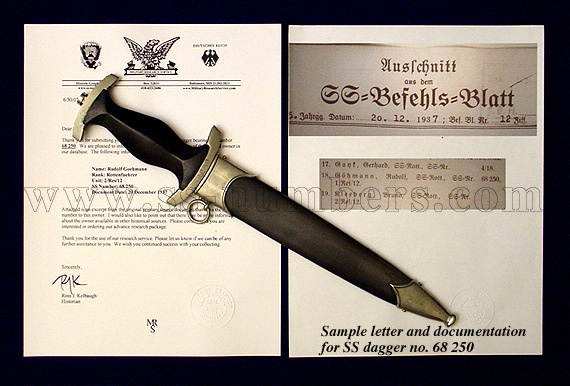 Supplemental SS Officer Research: Perhaps you have a SS dagger, SS sword, or Totenkopf ring whose owner you already know since it was numbered to an SS officer who was identified through the Officer Rank Lists (Dienstalterslists) published between 1934 to 1944. These lists provide valuable, but limited, information about your dagger's owner. What you might not know, however, is that most SS officers had a personnel file sometimes used after the war to facilitate possible prosecution of that individual for war crimes. These files can obtain extensive amounts of information about this officer's military career including photographs. In addition, we will check the records of the Office of Race and Resettlement (RuSha) and the Nazi Party (NSDAP) membership records and provide you with copies of these if available. All of these additional records can yield information that can greatly increase the value of you artifact. Fee for this Documentation Portfolio is determined by the amount of information available. Below are a few sample pages from the Documentation Portfolio (contents vary to amount of information available on each individual) done for the SS Dagger of SS-Obersturmführer Richard Heib, SS. No. 46 315. Pages are printed on acid free archival paper, placed in page protectors, and presented in a custom leatherette binder. A summary (1) of the SS Mann’s personal information, promotions, awards, and military service is created. Digitally enhanced prints (2) made from all of the best photographs (when available) are printed on premium glossy photo paper. Pages are provided for inclusion of dagger photos (3) which we can print if provided with copies. For SS Officers listed in the SS—Dienstalterslistes, we provide copies of all of their entries (4, 5). An introduction to all of the major record groups used in compiling your Documentation Portfolio is included so you know what files you actually have received (6). Copies of all pages found in the SS Officer (7) and/or SS Enlisted Men File (if available) provide valuable information about military service, especially if they contain the SS Mann’s service record card (8). Many were members of the NSDAP (9) and copies of their membership file cards are included when possible (10). Sometimes these include photographs which, in Heib’s case, was the source of the best one available of him (11). All records found in the Race & Settlement File (12) are included (when available) which can provide extensive information about a person and his fiancé/wife (all SS men and spouses had to obtain permission to marry to prove their racial “purity”). These records may include photographs, personal questionnaires (13) and family trees (14) that can go back to the 1800s. Information regarding those who were killed or missing in action are also included when available. Digital copies of all records and photographs are included on a CD for reproduction and sharing on the internet (15.) The Primary Owner Documentation also included with the Documentation Portfolio when we have identified a dagger's original owner for a collector.